There are many factors to consider when choosing fabric for your upholstery needs. Although color is an important factor there are other things to consider like durability and cleanabilty. Color of fabric is usually the first thing we think about when choosing furniture fabric. Colors can be either warm or cool and can affect your mood the instant you see them. Make sure you are choosing the appropriate colors for the moods you want to create. A tried and true approach is to place the more subdued patterns and colors on the larger pieces in the room. Trendy colors and patterns are perfect for pillows and accent pieces. Whites and neutrals have always been and continue to be a top choice for your main upholstered pieces. You may want to select more durable fabrics for the high traffic areas of your home. There is a widely held misconception that the thicker the fabric the more durable it is. Thickness has nothing to do with durability. The best way to be sure of a fabric’s durability is to inquire about it’s durability rating know as the double rubs rating. This rating indicates the wear and tear characteristics of upholstery fabrics. A machine rubs the fabric back and forth (one double rub) to scientifically test it’s durability. The higher the number of double rubs the better and the more appropriate for well used rooms like your family room or your favorite chair. Fabrics range from formal to casual and from traditional to modern. You can choose to keep them consistent throughout your home or mix it up for a more eclectic and individual style. Multiple fabrics can successfully be mixed in a room by varying the scale of the patterns while keeping color consistent. 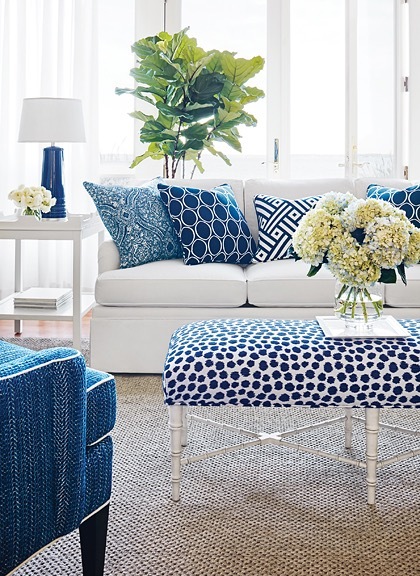 Mixing patterns with textures also adds interest and a designer touch to any room. We carry only the highest quality Upholstery Fabric. Come visit us in Juno Beach.